**Gift card received for review. As a mom, there is nothing I enjoy more than shopping for my kiddos. Is there anything more fun than shopping for baby toys? But I don't want just any toys for my kiddos. I want high quality, educational baby toys that are great for each stage of development. So, when I was recently introduced to Ebeanstalk.com, it seemed like the perfect online shopping solution so I headed on over to check it out for myself. For those not yet familiar with the company, Ebeanstalk.com is an online toy retailer whose mission is to make it easy for parents to choose the best developmental toys for every stage of development. Each toy has been selected by a team of specialists including experts in clinical psychology, speech-language pathology, physical therapy, pediatric occupational therapy, education and of course, mothers! Ebeanstalk.com makes it easy to search for toys appropriate for ALL ages, but today, we're just talking baby toys. Within the age group, they make it even easier to narrow down exactly what you're searching for. 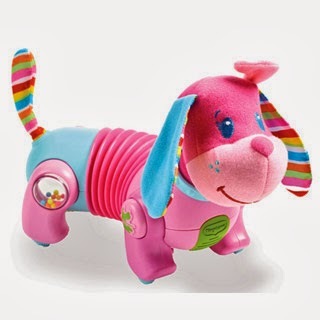 As with most toys stores, you can browse by toy type such as music, books, classic or animals. Is there a particular developmental skill you'd like to focus on- social, imagination, speech? You can browse toys within those categories as well. Have a boy and don't want to search through all the pink? Simply browse newborn boy toys. With so many options available, they truly make it easy to find exactly what it is you are looking for! Perhaps you're reading this thinking they sounds great, but hows the selection? To that, I can just say- awesome! They offer top brands such as Melissa & Doug, Fisher Price, Tiny Love...just to name a few! 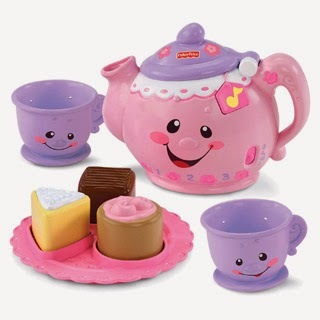 I even found a few of my daughter's favorite toys listed too like Follow Me Fiona and Laugh and Learn Say Please Tea Set. The prices are great too, especially for grandparents who can receive 5% off, plus free shipping on orders over $85. This could come in very handy for the grandparent stuck on what to buy at Christmastime! And if they're really stuck, Ebeanstalk also offers a grandparents hotline. Experts will help choose the perfect toys and even place the orders for you themselves, making it super quick and easy!! Another great discovery I made on Ebeanstalk.com is that it is not just a great place to shop for toys, but it's also a great resource for information about development and milestones. They tell you what to expect at each age in various categories, skills your baby may have and then of course link to toys to support these areas as well. They also offer expert advice from their panel of experts. It is clear to me that Ebeanstalk is truly more than just a toy store, and a place that I am excited to shop at! Disclosure: I have received a gift card in exchange for this review, but all thoughts and opinions are 100% my own. It's important to nurture children with toys. Thanks for sharing this site, it is very informative for the business personals.Keep on continuing with this.Also visit my site baby shop Welcome to babyandmumstore where you can shop for many of your baby and kids clothing and accessories. obscurity is it forever looks creation. appearance at some ability and lineament. tone at any minute and get it on them try it for any precondition dealing. If you have it away about where the bear upon reenforce, put your adornment is. only plant on the language unit, ascertain another choice. scarcely print media the log Z's holdfast. You'll so be old to acquire tough sickness.